This has been the first week of my new exercise plan from my PT, Ian. I do love having a plan and a focus for my training. It stops me fretting over the best thing to do, makes sure I have plenty of variety in my training and pushes me on a bit. It also stops me doing too much. Rest and recovery is just as important as exercise, as that’s when you get the benefits of the workout. Anyway, this is a great plan that should help me build a great base to be fit and ready to race some great triathlons next year. As far as running goes, I’m continuing to concentrate on my technique, changing my style to become a more midfoot, forefoot runner. That’s because I believe it’s a more natural way to run and less likely to cause injuries. But I’m hoping it will help me go faster too. At the moment, I’m just focusing on getting it right and not worrying too much about how fast I’m going. But it’s good to see some improvements there too. I have to really consciously concentrate on my new running style, thinking about how I place my foot on each step, making sure I’m kicking back, keeping my hips aligned and turning my legs over quickly. But I had a bit of a breakthrough moment this week on a technique session when I realised I’d been singing one of our choir songs in my head to help me keep a good rhythm. That means I wasn’t consciously thinking about how I was moving. The same song re-emerged as I returned to parkrun on Saturday morning. Last week, it was a big unknown. I had no clue how fast I would go with my new midfoot style. This week I knew what I was capable of, and that I’d felt I could push it a bit more. So, into the now familiar routine of saying hello to my friends, and lining up with a couple of hundred runners at 9am on the Town Moor. A bit damper and breezier than last week, but it was still a great day for a run. It felt great to be racing, even when a surge of runners went past and continued to pass me out on the way towards the first gate. As always, I worried that I’d gone out too fast and tried to settle into my run. A thank you to Malcolm on the gate and I was out alongside the road. 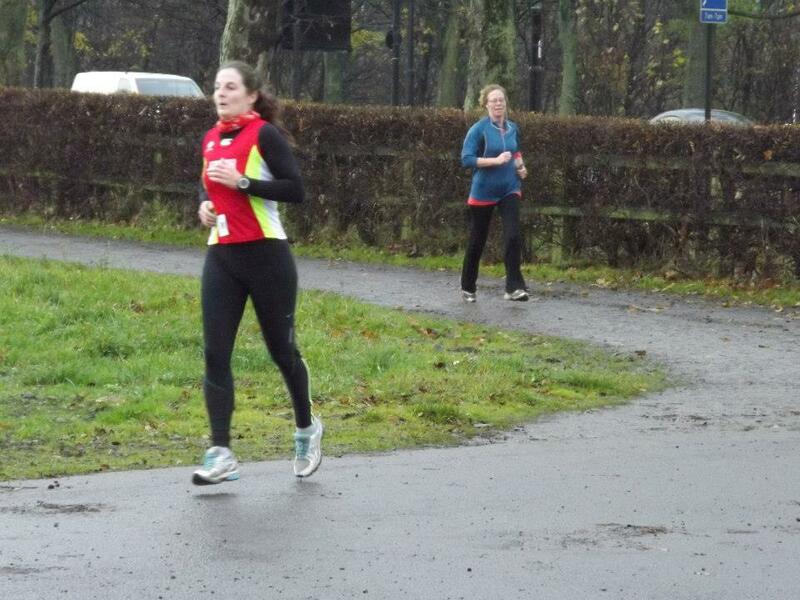 Here I felt I was picking my pace up a bit, almost with a sense of falling forward into each stride. I kept with it, enjoying the sensation and started to pick off a few runners in front. Through the second gate and onto the muddy path, which wasn’t as bad as I’d been expecting. I still felt good here, like I was flying over the ground, and the repetitive tune in my head picked up a beat or two. I just told myself to keep going if I was feeling good. Kilometre 3-4 is the tester on this course. a couple of turns and some uneven ground, it’s where runners start to fall away a little. I kept my focus by targeting runners ahead and reeling them in one by one. I didn’t even notice I was snapped again at the back of the museum. There was a man in a yellow top who I played a bit of cat and mouse with as he overtook me, then I caught and overtook him only for him to catch me again. It helped keep me focused, although I found myself very much out on my own over the toughest part of the course. Here I was starting to feel the pull on my calves from the new running style and a couple more flat footed moves came in as I negotiated the uneven ground. Once I fall away from the forefoot, it takes an effort of will to get back there. But I did it and made it through the final gate, knowing there was just over a kilometre to go. I’d made my mind up to kick on a bit on the smooth tarmac path as we turned towards the lamp posts. But the guy in yellow made me push on a bit sooner than I planned. He eventually overtook me and made it stick, but I knew I was close to the finish now. My breathing was becoming a bit more ragged as I tried to stretch out a little more while not losing my style and trying to make my legs turnover more quickly. I was aware the tune in my head had dropped its rhythm slightly. I picked it up before the dog leg to the finish straight and powered on down all the way through the line. I even missed picking up my timing token as I didn’t slow down enough and had to go back to collect it from the volunteer. I’d deliberately ignored my watch, save for a quick check at the first kilometre which had told me I was on pace with last week’s run. But I was hopeful I’d done better as I felt faster through kms 2-3. I checked at the finish and I was just a few seconds under 28 mins – a whole 30 secs improvement. So, it looks as though my new running drills are working and I’m getting the hang of this new style.